Bundy Hill has long been an attraction to the people of Mount Pleasant and the nearby area. 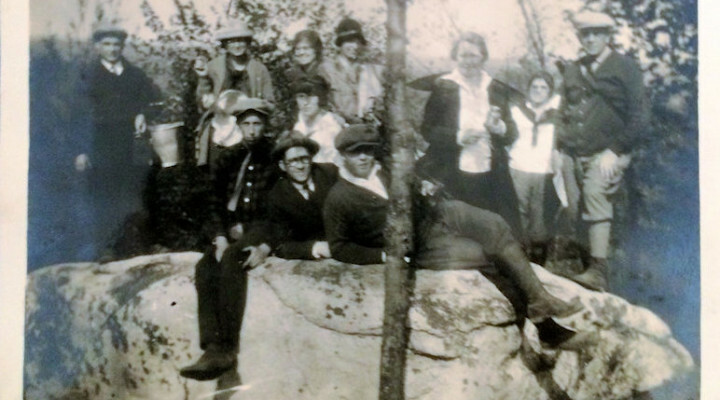 The large boulder near the top of the hill has served as a picnic table and photo opportunity for many, many visitors over the years. Here, we share one taken in 1925. Recent contributions to the Bundy Hill land acquisition project have boosted the amount raised to more than $112,000 in just the first five months. This puts us well on the way to meeting the need to raise $240,000 to purchase the 100 acres of land and provide for stewardship. Wouldn’t it be great if we could start promoting recreational and education opportunities at Bundy Hill as soon as this summer? Wouldn’t you like to create your own historic photo opportunity at the big rock? We can’t lose the great momentum now. Contributions can still be matched by Isabella Bank and the Rollin M. Gerstacker Foundation, meaning it’s not too late for the value of your contribution to be doubled. Click here for details.